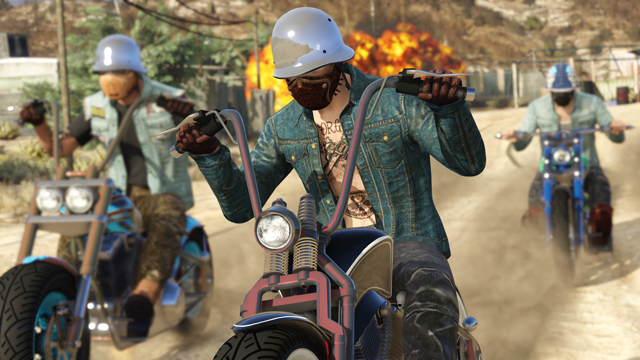 GTA Online: Bikers opens up an entirely new part of the criminal underbelly of GTA Online, bringing proper Motorcycle Clubs to the roadways and ever-evolving illicit markets of Blaine County and Los Santos. Life in an MC is more than just a fleet of shiny new rides and impressive leather cuts. 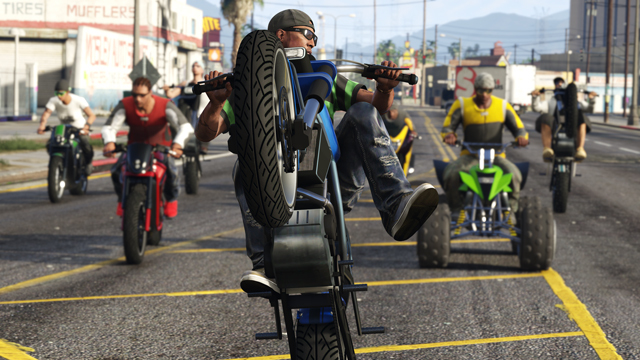 Bikers brings a range of new ways for clubs of up to eight players to earn their keep, battling rival MC’s and other criminal factions. Enterprising players can form and be the President of their own MC, while anyone seeking MC life can join as a Prospect. As newcomers prove their worth, Presidents can promote Prospects to meaningful roles within the club’s structure including Vice President, Road Captain, Sergeant-at-Arms, and Enforcer. Each MC role comes with its own unique abilities to help themselves and the larger MC, from dropping Body Armor and calling in Hit Squads to setting MC riding formations and starting MC Challenges. 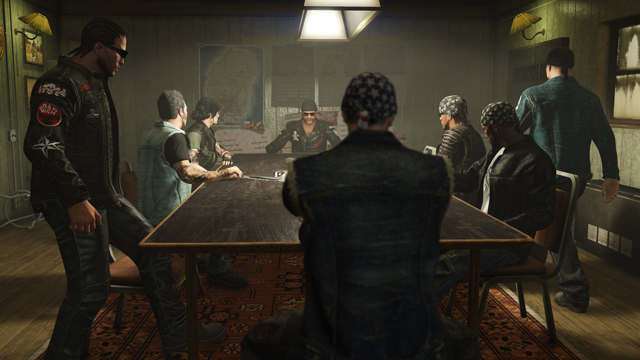 Each Clubhouse includes a meeting room; Presidents can use the Contracts Wall to launch new Clubhouse Contracts - a range of new Freemode missions for you and your MC members to earn some tidy GTA$ and RP through a range of noble deeds – from the forceful liberation of your falsely incarcerated allies to good old-fashioned gunrunning. Gangs will also work against other factions in Los Santos, including opportunistic rivals seeking to exploit your MC’s honest work for their own gains. The open road isn’t just a stretch of Chumash pavement anymore; log in to the nefarious Open Road online network to launch a new (non San Andreas Board of Commerce sanctioned) business. Choose how your MC is going to earn its money, as Open Road clients offer opportunities in document forgery and cash counterfeiting as well as large scale narcotics distribution. Small business owners will setup their operation with supplies before beginning production. Once your business is off the ground, build them further with risky resupply runs, and stay on the lookout for other factions who might take an interest in any unsecured operations. When you’re ready, trade your goods for a profit and use your gains to reinvest in your businesses with available security, staffing and equipment upgrades. Thirteen new impressive rides from sport bikes to choppers are ready to hit the road, giving you a full suite of wheels to fill the Clubhouse Garage of your petrol-fueled dreams. From the sleek, neon-accented Nightblade and the charismatic, three-wheeled Chimera, to the classic, rusted lines of the Rat Bike, there are options for every kind of rider available at Southern San Andreas Super Autos and Legendary Motorsports. The bike you choose to ride the most will become your favorite bike, which will provide boosts to health regeneration (including total health regeneration) and damage. With Bikers comes the ability to melee opponents from the seat of your bike and Ammu-Nation is stocking the new Battle Axe, Pool Cue and Pipe Wrench to help take down rivals quickly. Also available to knock opponents out of their seats with blistering power are the new automatic Sweeper Shotgun and Compact Grenade Launcher. Whatever kind of MC you roll with, there’s an extensive wardrobe of new styles to represent your affiliation including a wide selection of Jackets, Cuts, Helmets, and of course plenty of leathers and denim to choose from. Complement and trim your Bikers look with a selection of new Hairstyles and Tattoos. And for MC members, Presidents can set their gang’s style and pick from a variety of Emblems (or their very own Crew Emblem), then each member of the gang can choose their own outfit. The Emblem creator has also been updated to make Emblem creation easier. Stick together to hit checkpoints at the same time as teams of riders vie to be first over the finish line in Slipstream, the new Adversary Mode available today as part of GTA Online: Bikers. As teams jockey for lead position, taking full and clever advantage of the other players' slipstreams for speed boosts – and using well timed attacks to melee opponents off their bikes – can be vital in this contest to the bitter end. Seven maps are ready to race now.